Čačak (Serbian Cyrillic: Чачак, pronounced [tʃǎːtʃak]) is a city and the administrative center of the Moravica District in central Serbia. It is located in the West Morava valley within the geographical region of Šumadija. According to the 2011 census[update], the city proper has 73,331 inhabitants, while the administrative area comprises a total of 115,337 inhabitants. Long known as a spa town, the city lies about 144 km south of the Serbian capital, Belgrade. It is also located near the Ovčar-Kablar Gorge, which houses 12 different monasteries. 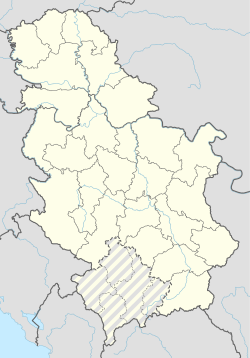 Čačak is located in the western part of central Serbia, within the region of Šumadija. Once densely forested, the region is today characterized by its rolling hills and its fruit trees. To the south, past the Ovčar-Kablar Gorge, lie the mountains of the Dinaric Alps. These mountains incline in a gentle and wavy way toward the Čačak valley and the West Morava River. Čačak has an oceanic climate (Köppen climate classification: Cfb) bordering on a humid continental climate (Köppen climate classification: Dfb). The average temperature of the city and its vicinity is 10.47 °C (50.85 °F) with 74.1% humidity, and it is characterized by warm summers and cold winters. Winds blow from the north and northeast and rarely from the west because of the mountains that block them. The average temperature in August is 20.6 °C (69.1 °F), while in January it is 0.5 °C (32.9 °F). There are on average 38 days with snow during the year. The average wind speed is 2.3 metres per second (5.1 mph). The usual number of foggy days is 54. The average yearly precipitation is 802 mm (31.6 in). There are a few recorded instances of sandstorms originating in the Sahara arriving to the town. The region has several archaeological sites, dating from prehistory to the present, the oldest from the 15th century BC. Princely tombs of an Illyrian type (Glasinac culture) were found in two mounds of Atenica with Ionian glass, glass-paste, an amber bead depicting a swan, and an Attic plaque of a wild boar, all dating to the late 6th century BC. More ornithomorphic fibulae of bronze swans was found in Mojsinje. Prehistoric tumuli have been unearthed in Mrčajevci. The Triballi and Scordisci tribes lived in this area by the time of Roman conquest. The town was inhabited in Roman times, with traces of the Roman settlement still visible today, like Roman baths built in the 2nd to 4th century period. These still stand behind a secondary school in the center of Čačak. Nearby, in the village of Gradina at the foot of the Jelica mountain, a Roman compound (fort) with a martyrium and necropolis has been excavated, with three churches, one of which produced a pentanummion for the late Roman Emperor Justinian in the 526–537 period. Justinian is also believed to have founded the fort in the 530s. The presence of burnt layers on the sight could be evidence that the settlement was destroyed in the conflict that characterized the region following the barbarian invasions of the late Roman Empire. In the same region, in the 6th century, four other forts were built. Slavs settled the area during the reign of the Byzantine Emperor Heraclius (610–641). From 1168 to 1189, after incorporation into the First Bulgarian Empire and then various Serbian states, Stefan Nemanja's brother Stracimir Zavidović controlled the West Morava region, including the city, then known as Gradac. Stracimir, a Serbian župan, raised the Church of Our Lady of Moravian Gradac at the highest point of the town. In 1459, the Turks completed their conquest of the area, incorporating it into the Sanjak of Smederevo and converting Stracimir's church into a mosque. The town's name was changed from Gradac to the current Čačak, Ottoman Turkish for 'mud'. Evliya Çelebi, an Ottoman explorer of the 16th and 17th centuries, described Čačak as the main place in the local kadiluk. In 1717, Čačak became a part of the Habsburg Empire after the Austrians defeated Ottomans, signing the Treaty of Passarowitz. Austrian rule was short-lived, and 21 years later Čačak would again became a part of the Ottoman Empire. Most of Čačak's Serb residents at the time of reconquest had deserted the town, migrating north safety in the Habsburg Empire. In their stead were settlers from Montenegro, Bosnia and Hercegovina and Vlachs from the countryside nearby. Čačak has two years on its coat of arms. The first is 1408, in which Ragusan archives first name the town. The second is 1815, the year the Second Serbian Uprising began and the year the Battle of Ljubić was fought in the hills near Čačak. This battle is famous for one of the greatest Serbian rebel victories. Then a small group, the rebels defeated a much stronger Ottoman army numbering 60,000 men. Soon after, the Principality of Serbia, one of the first nations liberated from Ottoman rule, secured its independence. In 1837, one of the first Serbian grammar schools was completed. In the 1837–1941 period Čačak gradually modernized, with its town center modeled in a Vienna Secession style popular at the time and standing to this day. During World War II, Čačak was part of the short-lived Republic of Užice, which, while the first liberated territory in Europe, was cut off by German forces shortly after it was founded. On 4 December 1944 Čačak was finally liberated by the Yugoslav Partisans. It has since evolved into a large town and a regional center, later being given the official status of a city within today's Republic of Serbia. The city's administrative area or municipality has 115,337 inhabitants, with 73,331 living in Čačak proper. The city of Čačak has 38,590 households with 2.99 members on average. The number of homes is 51,482. The city's religious structure is predominantly Serbian Orthodox (110,281), with minorities including atheists (577), Catholics (168), Muslims (73), Protestants (21) and others. Virtually the entire population speaks the Serbian language (112,505). Female - 59,342 (43.95 years). A total of 53,543 citizens older than 15 have a secondary education (54.01%), while 14,823 citizens have some sort of tertiary education (14.95%). Of those with a tertiary education, 9,386 (9.47%) have university education. From 1885, when Čačak had a population of only 3,000, small groups of Armenians began to settle in the town. They mostly originated from the villages of Kemah and Nerkin Bagarij (or Pakarish), near Erzincan in Ottoman Empire, fleeing the forcible draft into the Ottoman army and the general oppression against the Armenians in the empire. The first Armenian in Čačak was Arut Nigosjan, who worked as a tahmiščija or a coffee roaster/grinder. He was followed by the families of Sarkisjan (later changed name to Sarkisović), Nikolić, Sukjasjan, Bricki, Berberjan and Lazarjan, with most of them working in the coffee business. Lazarjan family was the best known Armenian family in Čačak as they expanded their business from just coffee to the grocery stores and were among the founders of the local Red Cross organization. New Communist authorities after World War II, in the massive process of nationalization, confiscated the Armenian businesses in 1948 so some of them emigrated abroad. In time, the Armenians began naming their children with Serbian names and blended with the rest of the population. The book, Jermeni u Čačku 1885-1950 ("Armenians in Čačak 1885-1950") was published by Marijana Matović in 2018. This city traversed a long and thorny road from an anonymous settlement to a modern city in the 21st century. The very face of the city, as seen in the facades, monuments, and cultural establishments, is the reflection of the artistic spirit of its inhabitants. During the theatrical season there are numerous theatrical ensembles on tour from all of Serbia at Dom kulture Čačak. It is home to a Drama Studio and schools of ballet, fine art and sculpture. Exhibitions and performances, cultural and literary evenings are held at the "Nadežda Petrović" and "Risim" galleries, the National Museum, the Salon of Photography, the Inter-Municipal Archive, the premises of the City Library, the Pupil Centre, etc. Fine art and sculpture colonies are most often held at the Ovčar Banja spa resort. There are numerous cultural, musical, entertainment and tourist manifestations within the city and close surroundings, which attract multitudes of followers of ethno-culture, original folk music, like the Dis spring, Memorial to Nadežda Petrović and the Flute festival in the nearby village of Prislonica, and other accompanying content. In Guča, 10 kilometres (6.2 mi) south from Čačak, every year the Guča trumpet festival is held, one of the most popular in the Balkans, alongside the Exit festival in (Novi Sad). In Serbia, there are 6,000 "Ijadas", meaning festival celebrating certain food or music whose name ends with the suffix "ijada" . The most popular in Čačak are Pitijada, Kupusijada, Fijakerijada, etc., that celebrate old traditions belonging to Serbs. The current artwork production in the city can be followed through the auspices of groups and associations, private galleries, colonies and numerous enthusiasts. There are many primary schools and childcare centers. Čačak is nationally famous for its clubs in various sports; the most popular ones are basketball, football and handball. Basketball club Borac Čačak and football club Borac Čačak have been participating in the top-tier leagues of Serbia for many consecutive years with much success. Women's handball is also very successful and popular. Thermal and mineral springs with medicinal properties provide the basis for the development of recreational tourism. There are three spa resorts within the territory of the city of Čačak: Gornja Trepča, Ovčar Banja and Slatinska Banja. There are also picnic sites: Gradina and the "Battle and victory" park (also called "Spomen" (remembrance) park) on the Jelica mountain, the Memorial complex on Ljubić hill, Grujine fields, rafts on West Morava river in Beljina, Parmenac, Međuvršje and Ovčar Banja, and picnic sites on the tiny rivers called Dičina, Kamenica, Čemernica and Banja. The structure of the economy of the city of Čačak is composed of services and trade, industry and agriculture. The main processing industries are paper production, electric home appliances, blade tools for the processing of metal, non-metals, chemical industry products, thermal technical appliances, metal and combined carpentry, parts and kits for the pharmaceutical industry and products for medical needs. Also, well developed are wood, lumber industry and agriculture. Many companies with more than 250 employees have deteriorated due to the sanctions in the 1990s. Since 2000, more than 40 government-owned companies have gone through the privatization process. Private enterprise, which has its tradition from back in the 19th century, is the primary characteristic of the economy of the city. As of January 2017, 98.65% of all business enterprises are small and micro companies. A large number of private companies grew into middle-size companies with 80 to 270 employees offering a wide variety of products. Today, on the territory of the city of Čačak, largest employers are Sloboda Čačak, Technical Overhaul Military Institute (Remont), Hospital Čačak, Fabrika reznog alata, P.S. Fashion and others. Čačak also has the prestigious and country's unique Fruit Research Institute located in city center zone. For the 2017 calendar year, business enterprises in Čačak imported the goods in value of 269 million euros, and exported goods in value of 171 million euros. The coverage of imports by exports was 64%. ^ "Municipalities of Serbia, 2006". Statistical Office of Serbia. Retrieved 28 November 2010. ^ "2011 Census of Population, Households and Dwellings in the Republic of Serbia: Comparative Overview of the Number of Population in 1948, 1953, 1961, 1971, 1981, 1991, 2002 and 2011, Data by settlements" (PDF). Statistical Office of Republic Of Serbia, Belgrade. 2014. ISBN 978-86-6161-109-4. Retrieved 27 June 2014. ^ "Čačak – geographical position". TurizamCacak.org.rs. Archived from the original on 30 May 2011. Retrieved 22 April 2017. ^ "Climate: Čačak, Serbia". Climate-Data.org. Retrieved 13 February 2018. ^ "直の日記". To-Cacak.com. Retrieved 22 April 2017. ^ Petrova, Ekaterina. "Balkan Travellers - Archaeologists Discover Pre-Historic Tumuli in Central Serbia". BalkanTravellers.com. Archived from the original on 23 April 2017. Retrieved 22 April 2017. ^ "ETHNICITY Data by municipalities and cities" (PDF). stat.gov.rs. Statistical Office of Serbia. Retrieved 1 March 2018. ^ Gvozden Otašević (9 April 2018). "Ljudi kojima je "ić" bilo spasenje" [People for whom "ić" was a salvation]. Politika (in Serbian). ^ "- :: Grad Čačak ::". Cacak.org.rs. Retrieved 22 April 2017. ^ "U Čačku još dva velika preduzeća nisu privatizovana - "Fabrika reznih alata" i "Sloboda"". ekapija.com (in Serbian). Retrieved 30 March 2015. ^ "U Čačku posluje 6.113 firmi i preduzetničkih radnji". moravainfo.rs (in Serbian). 14 January 2017. Retrieved 24 January 2018. ^ a b "Iz Čačka najviše u EU i zemlje bivše YU". b92.net (in Serbian). Beta. 4 February 2018. Retrieved 29 March 2018. Wikimedia Commons has media related to Čačak.